Winston Churchill once described Uganda as “The Pearl of Africa”, though with news footage of the horrific Milton Obote/Idi Amin reign of terror during the 1970’s still fresh in the memory of many, such a lovely description my well defy belief. During those terrible years Uganda-the country, its people and much of its wildlife were decimated; not surprisingly tourism all but stopped. When things settled down slowly the first tourists started to return, initially drawn by the famous mountain gorillas in the Bwindi Impenetrable Forest National Park. Gradually Uganda stabilised, several national parks were established, and the animals began to return. Much money has been spent on improving the countries infra-structure, and as a result Uganda looks poised for an exciting and prosperous future. 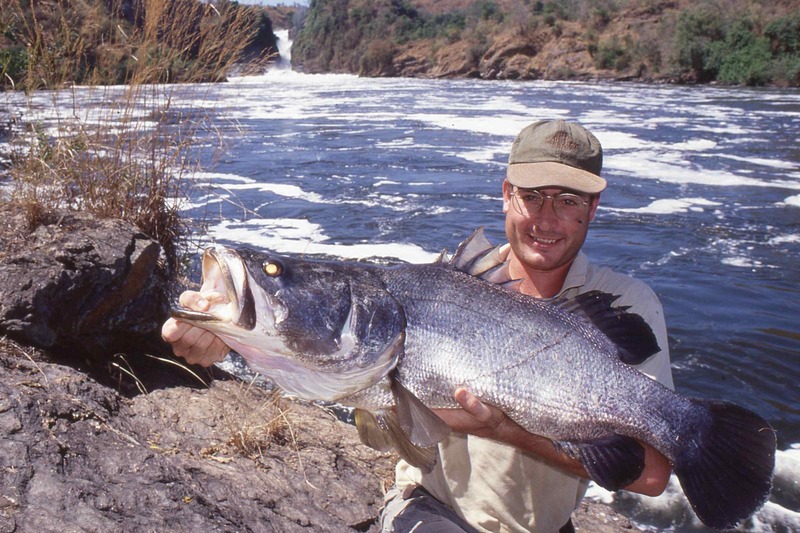 My first visit to Uganda had been organised to explore what historically had been some of the finest Nile perch fishing available anywhere in the world. We would, I was told, be fishing for world-record-class perch with several monstrous fish weighing over 200lb having been caught in recent years. On arrival at Entebbe myself and traveling companion John Wilson were met by Jonathan Wright, a director of Semliki Safari Lodge & Safari’s who had organised and would be hosting our trip. Jonathan drove us north to the Murchison Falls National Park, and the extremely smart and well appointed Nile Safari Camp which was to be our base for the first three days of the trip, though during the 5 hour journey we often stopped to sample the truly amazing street being offered be vendors working small barbecues at most of the dusty villages we passed through. Roderick Impey Murchison, in whose honour Murchison Falls and later the park were named, was president of The Royal Geographic Society on three occasions between 1851 and 1871. During this time finding the source of the Nile was one of that historic societies greatest goals, they sponsored several lengthy and extremely costly expeditions led by such great explorers as Speke & Burton. After many years of arduous exploration it was finally determined that the true source of the Nile lay on the northern shoreline of Lake Victoria, near the town of Jinja. 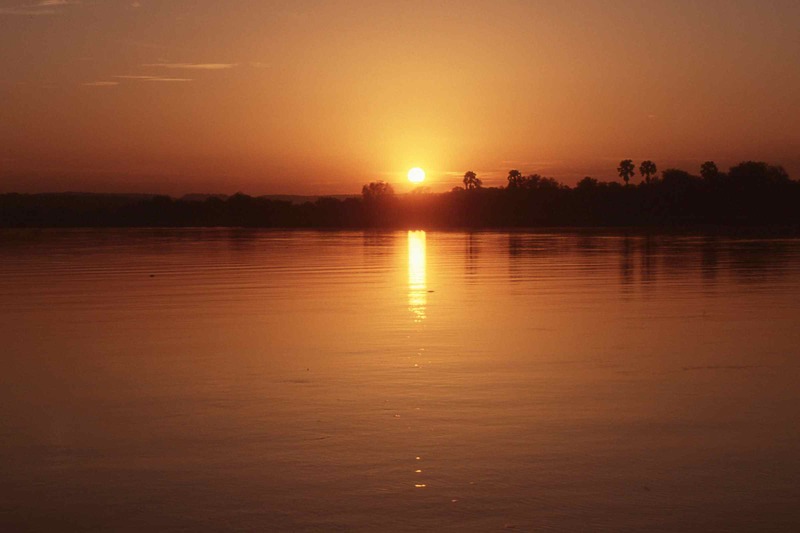 From Jinja a short river flows into nearby Lake Kyoga, the start of an epic 6,400km journey through northern Africa to the Mediterranean. 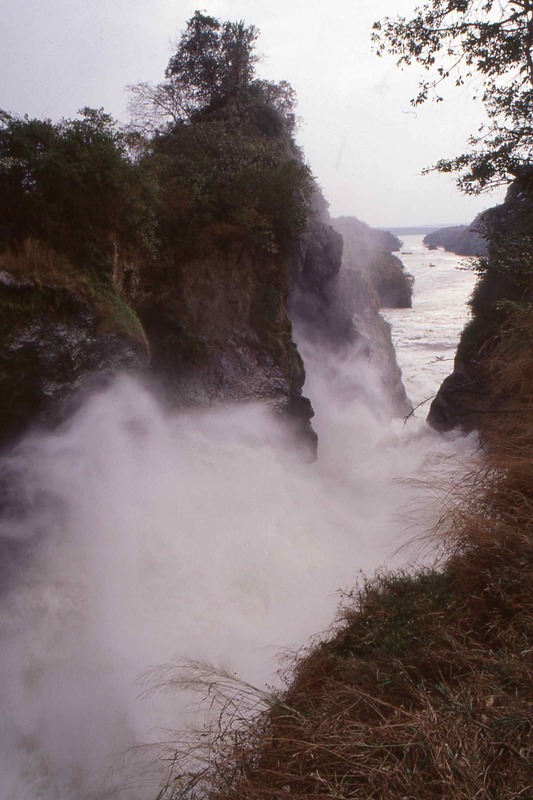 From Kyoga the Victoria Nile flows north and west towards the Murchison Falls National Park, where at one point it is constricted and forced through a 20ft crevice in the rock before plunging in an explosion of foaming white water and spray 300ft down into an enormous Jacuzzi of a pool. Below the falls the Nile continues through a deep, narrow and heavily forested gorge, flowing swiftly from one pool to the next on its short journey south towards Lake Albert, from whose northern shores the river, now called the Albert Nile, runs north towards Sudan. And it was here, in the gorge, where, at the very crack of dawn the following morning, our Nile fishing adventure was set to begin. It was only an hour or so after sunrise, and we had travelled several miles upriver from camp and left our boat securely moored to the stout branch of an overhanging tree at the furthest point at which we could safely navigate our way up the river. The remaining mile or so would have to be covered on foot, and now the jungle we were walking through was so dense that often our view of the river was restricted, despite it being nearer than 50 yards away; though the ever-increasing thunderous roar of the falls told us we were nearing our destination. The heat and humidity were starting to take their toll, as ladened with our fishing tackle we steadily trekked along a the narrow track. Occasionally a baboon would bark in alarm at our approach, and instantly the rest of the troop would take up the cry, their raucous sound being magnified by echoes as it bounced off the cliffs and reverberated around the deep gorge. Troops of colobus monkeys, startling in their black and white livery, crashed through the high forest canopy, and on several occasions we were treated to the glorious display of a passing Ross’s Turaco, its stunning violet blue and crimson tipped plumage vivid against the unbroken sea of green. The haunting cry of an African fish eagle pierced the heavy morning air. Eventually we turned off the main path and half climbed half slid down the bank to the waters edge. In front of us a short promontory of boulders jutted out into the river, creating an enormous an obviously very deep swirling back eddy behind it. A few hundred yards up river the falls thundered down into the historic and aptly name “Devil’s Cauldron”. I very much doubt if a more scenic destination for a morning’s river fishing exists anywhere in the world. For many years Uganda was a part of the British Empire, a time when ‘sporting gentlemen’ would often find themselves based overseas for many years. 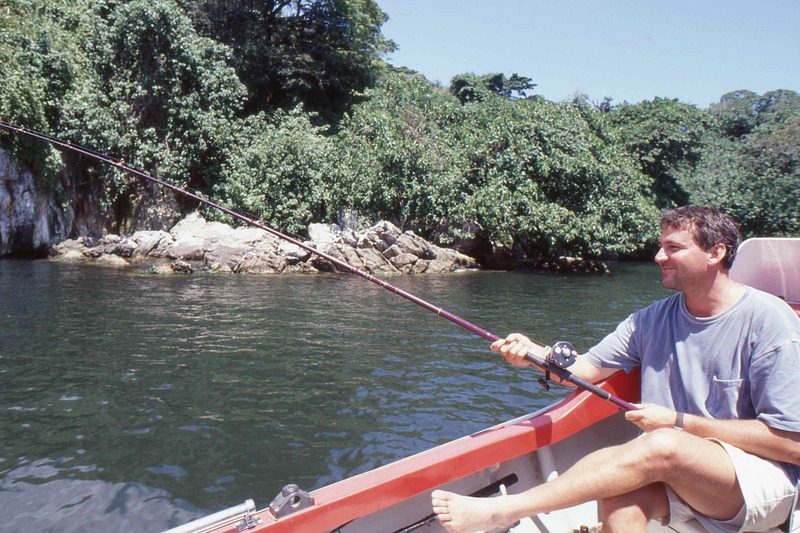 Many were salmon and trout fishers who were keen to continue their sport when serving abroad, hence the introduction of brown trout into countries such as Kenya, New Zealand, Australia and Argentina. A worthy replacement for salmon, of course, posed a more difficult problem, with the end result being that these sporting gents were forced to find an alternate species to ‘angle’ for. 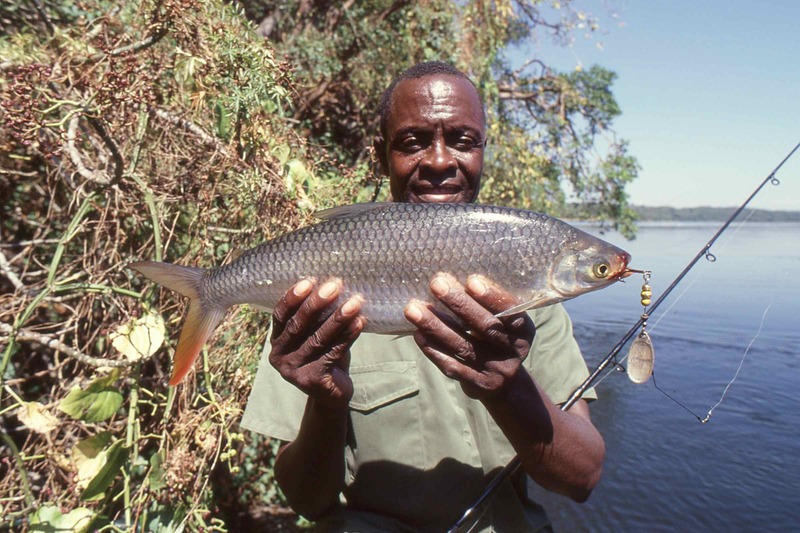 In India they quickly discovered the mighty mahseer, while throughout Uganda, Sudan and Egypt, the Nile Perch became a popular species. 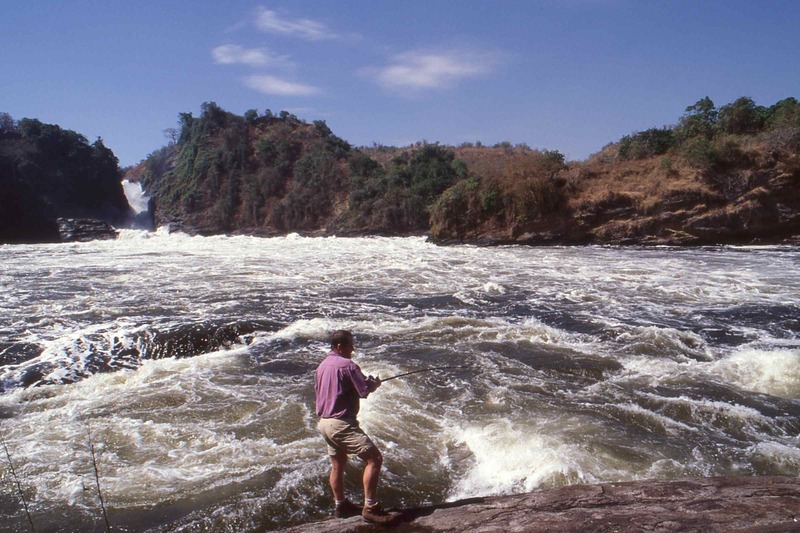 Uganda was a flourishing British colony, and the area around Murchison Falls became a popular fishing and hunting location. Not a great place to slip and fall in! 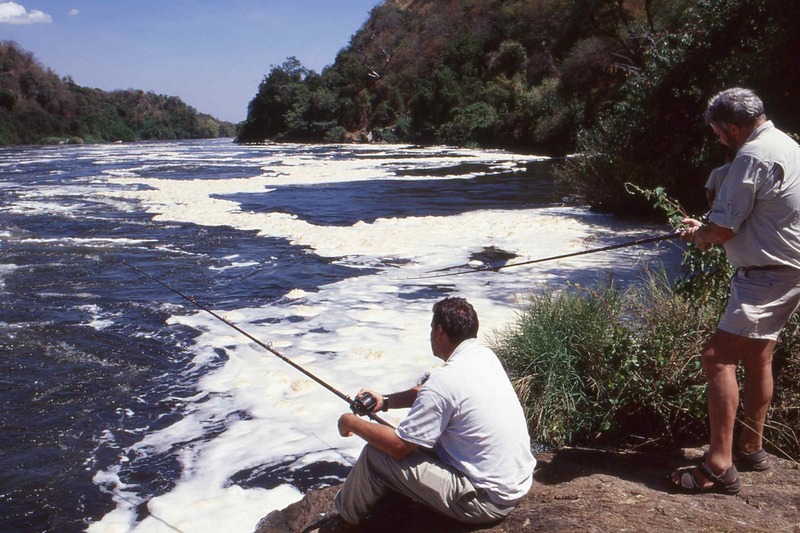 The naming of pools is inherent to salmon fishing, and that tradition continued on the River Nile at Murchison. 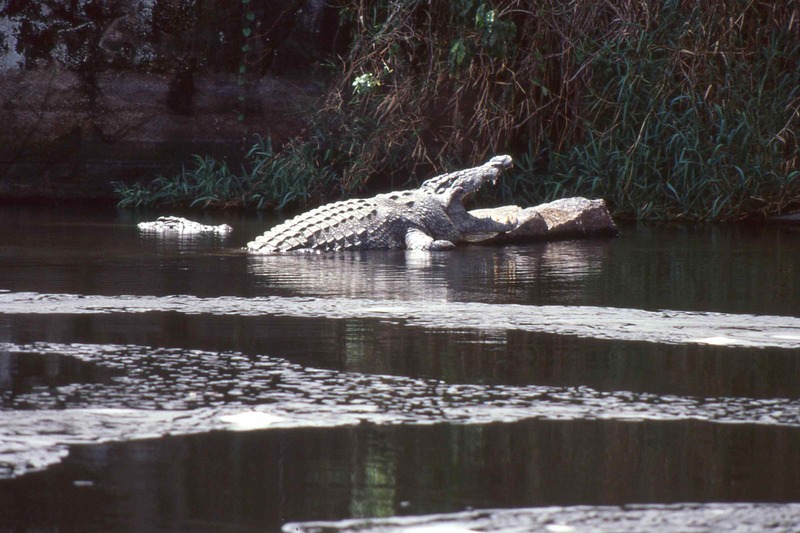 Many pools on the river are still widely referred to with the romantic and descriptive names those British colonials gave them; The Devil’s Cauldron, The Claw, Crocodile Rock, The Jackpot, Fraser’s Pool and Mputa Bay to name but a few. It was here that Ernest Hemingway survived two of his three air crashes while on a hunting expedition, part of the wreckage is still visible. Anglers still fish at Murchison and there are two popular techniques used to catch Nile Perch. Lure fishing using large, deep diving plugs can be productive, but can also be incredibly hard work giving the tough conditions encountered on much of the river below the falls. The other and probably most productive option is to fish either a static dead or best of all a large live bait. 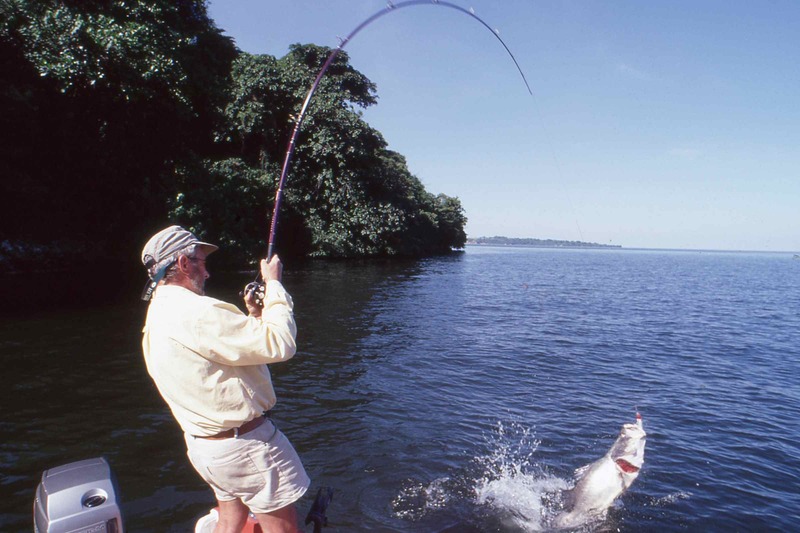 To catch your bait you have the option of either using a cast net in the quieter back waters, which is effective though tends to produce only small baits. 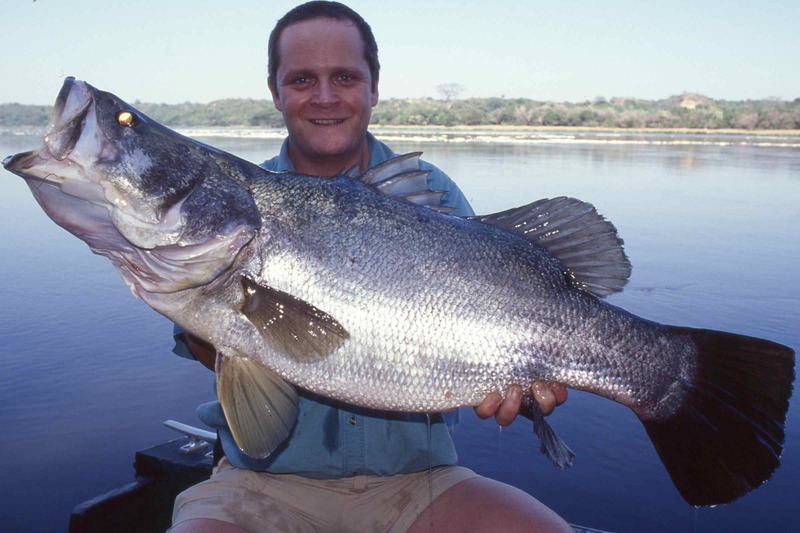 Alternatively you can use a light spinning rod and small lures to catch a plethora of larger fish species, that include at least three species of tigerfish. Other species were new to me, one of which resembles a toothy rudd/tigerfish hybrid and is called an ‘awaka’. 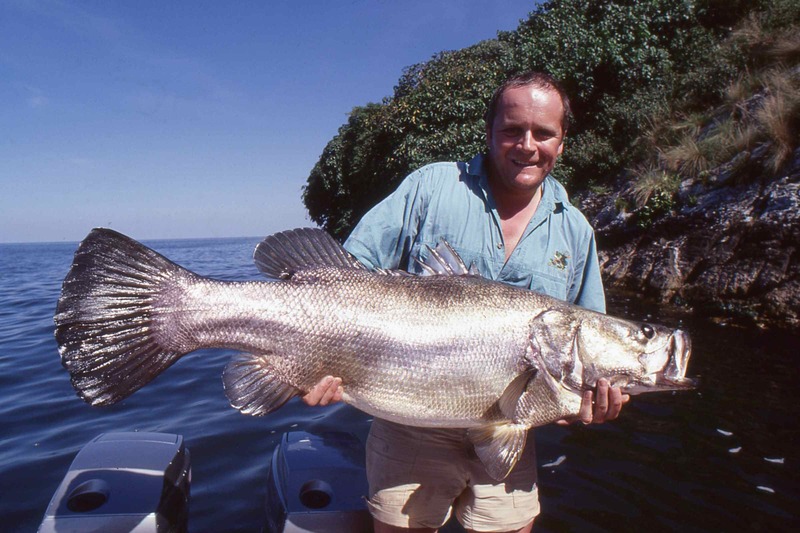 Nile Perch themselves make a great bait. Catching the baitfish on light tackle amidst such stunning surrounding is almost as much fun as the main event! My first bait was a tigerfish of about 2lb, which I gently lobbed about 30 yards out into a well defined crease of slack water just inside of the main current. Using just enough lead to ensure the bait sank to the bottom, I could feel the bait getting worked around the outside edge of the pool by the current. Holding the rod, the reel in free-spool, waiting for that first strike of the day is a magical experience and regardless of how many times I experience it, I doubt I’ll ever get used to the raw excitement that surges through my body when I feel the first positive indication that something deep in the swirling waters in front of me has taken an interest in my offering. That first bait had been at work for maybe ten minutes when the bite came. First I felt a series of solid knocks that gently pulled a few yards of line off the reel, and I fed the fish some slack line, eager to ensure the fish was given enough slack to fully take the bait unhindered, while also conscious of the fact that if I allowed it to run for too long it would almost certainly drag my line around a snag. I forced myself to count to ten slowly, then pushed the lever drag forward to the strike position, allowed the line to tighten, then set the hooks firmly with a series of strikes. The fish reacted instantly, peeling many yards of line from the reel as it surged straight out into the main flow of the river, which it used fully to its advantage as it powered off down stream. It did not run too far, and despite the substantial bend in the rod and spirited fight from the fish I could already tell it was not one of the really big monster perch. After about five minutes of ‘give-and-take’ I slid the chromium flanked body of a chunky thirty-something-pounder into the shallows. Next morning it was still dark when local guide Marco Magyar, who has personally caught perch to 237lb, picked us up at the Nile Safari Camp. Swiftly we sped up river while the sun made its stately appearance in the eastern sky, finally exploding over the horizon in a gorgeous display of fire orange and red. En route we passed hundreds of hippo’s wallowing peacefully in the shallows, along with dozens of huge crocodiles. On the bank elephant browed fruiting trees, while buffalo and several species of antelope and buck including Uganda kob, grassed the patches of open ground. Very quickly I lost count of the number of different species of birds, which include that rarest of ornithological rarities; the shoebill stork. Marco took us to was a wide, papyrus fringed pool at the start of the main gorge, perhaps a mile down river from the the falls where we had fished the day before. We beached the boat at a junction pool where a sand river flowed out from the dense jungle to join the main river; classic fish-holding water. 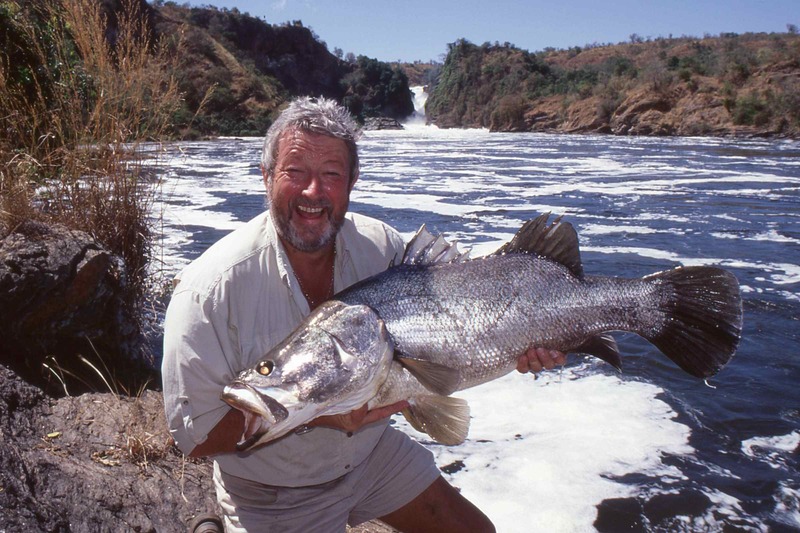 John hooked the first Nile perch within half an hour of drifting a live ‘awaka’ he had presented on a float rig, through the length of the pool. In what I now knew was a typical response the fish took off down river, heading straight out towards the fast water in the main channel where it used the current to rip many yards of line from John’s reel. After five minutes and showing no sign of tiring the fish, which we estimated at about 70lb, exploded into the air, violently shaking it’s huge head in a gill rattling display of anger and aggression, and succeeded in successfully throwing the hooks. During the next couple of hours we hooked and landed several ‘samatunda’ catfish, a species that grow to over 100lb, along with a few smaller perch to about 30lb, not to mention dozens of hard fighting baitfish. We both missed a couple of powerful runs, which were probably big perch though could quite easily have been one of the many crocodile we saw! During the week we fished at Murchison Falls we alternated between fishing from the bank and the boat at several locations within the National Parks boat. We caught plenty of perch including fish weighing better than 50lb, along with several big catfish, though the really big perch eluded us. I applaud those Victorian gents with their split cane rods and antiquated tackle with which they battled many such fish; I bet a day on the Spey or the Tweed casting for salmon when eventually they returned home was never quite the same for again! Leaving Murchison we drove south back to Entebbe. Here we met Paul Goldring who runs a guiding operation based on Lake Victoria. In his fast, open boat Paul took us south across the lake, crossing the equator into the southern hemisphere, on a 90 minute trip out to the Ssese Islands. 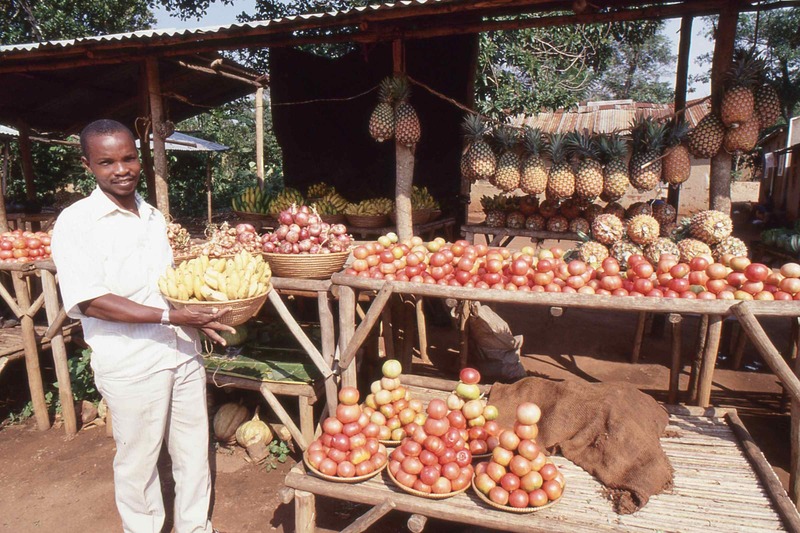 The Ssese Islands form a straggling group of 84 islands, which with their white sandy beaches and heavily forested interior look more like tropical islands in the Caribbean or South Pacific rather than islands on a freshwater lake in the centre of Africa. Fishing around the Ssese Islands involved trolling lures around the very edges of the individual islands, often fishing in deep water within a rod length of the adjacent shoreline. We caught perch each day, plenty of them, which included several specimens over 50lb and our biggest fish of the trip, a 90lb fish that fell to John’s rod. While the fishing alone was exciting, once again we were treated to a rich variety of wildlife, which among countless species of birds included some of the largest monitor lizards I’ve ever seen, and dozens of African otters. All too soon we were back on the mainland, and following a memorable meal at an Indian restaurant in central Kampala, were once again back at the airport at Entebbe, driving past the hijacked Israeli planes made famous in the film Raid on Entebbe. Walking through to the airport departure lounge, both John and I agreed we would be back fishing in Uganda at the earliest possible opportunity.